Braun, one of the world’s leading brands in the men’s grooming industry, has made a revolution with its Series 9 shavers. The Braun Series 9 9240s Men’s Electric Foil Shaver is no exception to this rule. Just like all other Series 9 models, it is considered as the world’s most efficient shaver, and per a study conducted recently, where it was tested on 3-day beards along with some of the premium names in the field the Braun Series 9 emerged on top, because of its sophisticated technology, user-friendly features, flexibility, durability and high quality of performance. Apart from being sleek and stylish, this is one model which will help you get hold of more hair in fewer strokes than any other shaver. Read on through our electric shaver review to learn more about the features, pros and cons of this shaver so that will know if it is a worthy buy or not. The first trimmer manages to cut all flat-lying & uneven hairs that go unnoticed by most of the other shavers by using its HyperLift and Cut Trimmer. The second trimmer aligns and cuts hairs growing in different directions with Braun’s Direct and Cut Trimmer. The third shaving element smooths the skin with the protective skin guard to help ensure minimization of skin irritation. The fourth shaving element is the 2x Opti-foil which allows for maximum closeness of the razor. The final shaving element is the 10-D Flexible Shaving System which independent flexible cutting elements mounted on a 10 directional pivoting head. They use Micro and Macro Motion. Adapts to all kinds of beards within seconds, thanks to the high-power Syncro Sonic technology which has an adaptation rate of 160 times per second and gives you extra pressure on difficult areas or dense hairs, because it has 40000 cross cutting actions per minute. Has a precision trimmer which slides out the back of the shaver to shape sideburns. Macro Motion is 40 degree pivoting shaver head which contours over your skin for maximum skin contact. Micro Motion is the individual suspension of all cutting elements to respond to the smallest contours of your face. 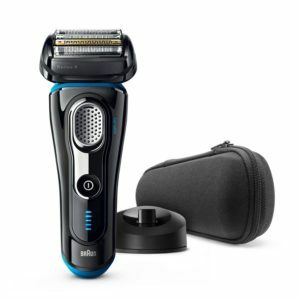 The Braun Series 9 9240S Series 9 Electric Foil Shaver from Braun brings the top of line in technology with this electric shaver. It is currently priced at around £200, but with all the features and advanced technology and longevity of shavers from Braun this is a good investment. It currently has 4.4 out of 5 stars with a significant amount of reviews and 89% over 4 stars, and only 1% one star. This shaver lives up the hype, but it is quite expensive.